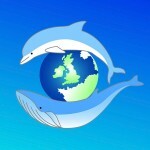 The Sea Watch Foundation is a national marine environmental research charity that aims to achieve better conservation of whales and dolphins in the seas around Britain and Ireland, by involving the public in scientific monitoring of populations and the threats they face. It is the longest-running research charity in UK focusing upon cetaceans around the British Isles, and maintains a national sightings database, the largest in Europe. It works closely with all the UK statutory conservation agencies, and advises UK government, the UNEP Regional intergovernmental Conservation Agreement – ASCOBANS, the European Commission, as well as the major conservation charities and marine industries operating in the UK. At Sea Watch Wales, we are dedicated to raising awareness, knowledge and conservation of the marine wildlife of the region. Our work is funded by the Countryside Council for Wales, Defra, the Joint Nature Conservation Committee, and Environment Wales; and we work closely with the local management authority, Ceredigion County Council.